Carola Menzel is Senior Project Manager and Advisor at the Frankfurt School – UNEP Collaborating Centre for Climate and Sustainable Energy Finance with a background in sustainable energy, development finance and institutional development. At the Centre, she is focusing on developing organisational structures and processes for mobilising and managing climate finance. At the Frankfurt School-UNEP Collaborating Centre for Climate & Sustainable Energy Finance (the Centre), we support a variety of initiatives, which strive toward the same goal: to engage a wide variety of actors to advance the transformation to resilient low-carbon and resource-efficient economies by attracting new types of investors, in particular catalyzing the private sector. This also involves capacity building; i.e. training and technical assistance to set up the necessary enabling framework, for example in financial sector institutions. In principle, there is ‘no one-size-fits-all’ policy solution for accelerating green growth. When designing green growth policies or programmes, first of all, it is important to identify the actual barriers and risks that prevent green projects from happening. And as can be observed in a number of countries (and sectors), generally a mix of different economic and industry policies and instruments (e.g. subsidies and fiscal instruments) is used to overcome barriers and mitigate risks to mobilise investments. Though traditionally central banks do take into account banking risks, commonly they do not consider environmental and social risks. However, introducing regulations or policies that address environmental and social risks appears complementary to their other functions. The German Agency for International Cooperation (GiZ) is supporting the implementation of the National Green Growth Strategy (NGGS) in Vietnam and assisting ministries and government agencies involved in the NGGS implementation, including the State Bank of Vietnam (SBV – the central bank), which aims to reform the financial system such that it is supportive of environmentally and socially sustainable development. In this context, the Centre has been assigned by GIZ to assist the SBV in the development of green credit programmes. After reviewing existing concepts drafted by SBV for enhancing green credit and social and environmental risk management in credit activities and drawing on lessons learned from green credit policies and facilities from other countries, the Centre provided advice on developing green lending policies. With reference to common public finance instruments for investment support and illustrative international cases of green credit policies and programmes for engaging the financial sector, the Centre outlined some major lessons for developing green credit policies. 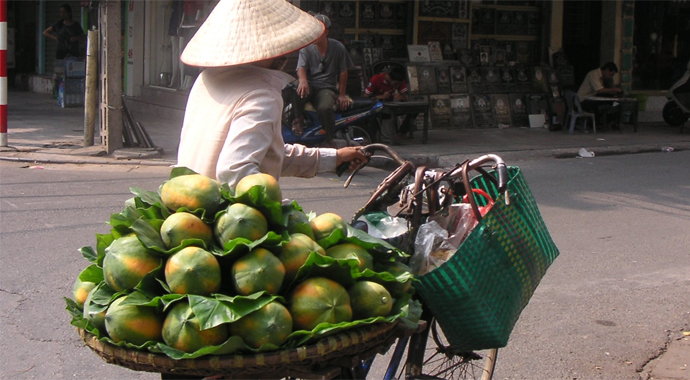 Overall, a basketful of mechanisms will be needed to implement the NGGS of Vietnam. In addition to advisory services, Ms Carola Menzel, Senior Advisor and Project Manager from the Centre, also contributed to the seminar ‘Green Credit Programming’ on 18 June 2015, which was organised by SBV and GIZ, by providing an introduction to international experiences and lessons learned on green credit policies and climate facilities. National and international financial institutions, related ministries and SBV departments, as well as donors and international organisations participated. the seminar with the public. In order to realise SBV’s green credit program, comprehensive capacity building for participating financial institutions will be critical. Having worked with financial institutions on sustainable lending practices in a number of other countries, the Centre was able to draw on a range of experience and shared with SBV some ideas for developing and facilitating capacity building measures.